Pseudo Sun - "Atomic Dogs Don't Bark"
Work on Atomic Dogs Don't Bark" started in May '98 when the new band (Juba Nurmenniemi: bass, vocals, keyboards, Erca Lindsvärd: drums and Mats Jassa Singh: guitar and vocals) entered the studio. This line-up can also be heard on the cassette only release "Aliens Only" (July 1998, M + E label). The original album which also featured David Garcia-Lopes on violin was ready by summer '99. Sadly no label took interest in releasing the album so it got shelved. A year ago Mats Jassa Singh left the band. Pseudo Sun tried to find a new guitarist but up to this day they found none. Instead they found keyboardist Jens Lindstrand. What we have here now is the new version of Atomic Dogs Don't Bark, and anyone who heard the first version will agree that this new final version is by far better. In fact, there are only 3 of 6 songs of the old version on the new one ("Mutiny", "Under Water World" and "Atmosfear"). Juba added 2 more recent songs to the album ("Shapeshifter" and "If I Only Had Time") which makes the album a lot more coherent IMO. Mats Singh still plays guitar on these. The album starts off with "Mutiny" (5:17), the classic heavy opening track of Pseudo Sun's first ever live gig in Jönköping in 1998. This version is the much cleaner studio version featuring some marvellous mellotron, but still pretty heavy, especially because of Juba's Rickenbacker bass. The sound quality throughout the album is faultless, absolutely professional. On "If I Only Had Time" (11:14) the new synth player Jens Linstrad can be heard. He does play some great electric piano on this track. And Mats guitar playing is amazing. The middle part is excellent when the band gets into some slower rhythm and very spacey Floydian synths (or Hawkwind's synth sounds on Amazing Sounds) are being played. Some minutes later the band somehow get back to the song. This construction of the song reminds me of the way Hawkwind do theirs. 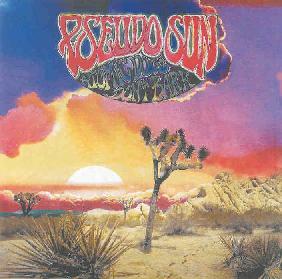 But then again, Pseudo Sun is not another Hawkwind clone (we got enough of those methinks), they surely have a unique style of their own. "Under Water World" (4:18) is a great pop tune with some splooshy weird synths/keyboards in the background which makes you feel like being a fish in an aquarium. A great tune, but beware: This is a very persistent earworm! The track is segued into "Shapeshifter" (8:06) and again this benefits from Jens piano playing. This song has some slower verses and a faster chorus. The synths are sounding very 70's like which is great to my ears. Especially the second instrumental part of the song is just unbelievably great pure spacerock; my high point of the album! The final song is "Atmosfear" (14:16) which also was the last song in Jönköping '98. Again, some additional mellotron makes this track even better. The drumming is especially good on this song. A great one. Well, what can I say? It s just one great progressive space rock album, with all the ingredients a space rock fan needs. I know that some people say that Juba should quit singing because he just cannot sing. But the same can be said of Ali Davey. Still we got used to it, didn't we? At least what we have here are some real clever songs and some real inventive and imaginative music in perfect sound quality. Ok, I have to admit I'm a Pseudo Sun fan and I'm trying to push this album a bit, not only because I am involved with it in some way, but this band really has some great potential, which this album proves. I really like Atomic Dogs Don't Bark a lot, and it grows with each listen. And I listen to it frequently. You can get this CD through Pseudo Sun's website at: http://warp9.to/pseudosun. Prices are: UK£ 7 / 10 Euro / US$ 10 including p & p.
The CD is also available through the Aural Innovations mail order catalog at: http://aural-innovations.com/mailord/mailord.html. By the way, Pseudo Sun is still in search of a new guitarist!